To those who beat the odds and purchased a badge, I salute you. You made it soldier, but now unless you plan on sleeping in line for Hall H each night, you need a hotel room. Comic-con's official hotel sale is this Tuesday, March 24th at 9 am. In 2013 all hotels were gone in 3 min. Last year all downtown hotels were gone in 90 seconds. Comic-Con International has said it for years, the demand simply outweighs the supply of available hotel rooms. So how do you stand a chance against the hordes vying for a room? You plan like your life depends on it. Unless you've found Doc Brown's Delorian, you can't go back in time to reserve cheap back up accommodations downtown. That being said there are still rooms out there but they'll cost you. Some folks split with friends or folks they meet on reddit to negate the high cost, more on that later on. Check out vacation rental sites such as Airbnb and VRBO. Many locals leave town for Comic-con week and may list their place to negate the costs of their own vacations. There are several hostels in the downtown area, but do your research ahead of time. Some offer discounts for multiple people and others have private rooms, though these are usually booked months in advance. Yes, practice. I know it sounds crazy, but when the difference between no hotel and a dream hotel is seconds, every hesitation you can avoid counts. Memorize the order of the form and practice typing it all out on a word file. If something continually trips you up, like your phone number, have it copied and ready to paste in the moment. If you have multiple people in your party, have their info on a document to copy and paste into the form. Below is a shot of what the form has looked like in past years. There is a complete and working practice form available through the Friends of CCI forums after registering as a user. Link Here. Information is power. This year there are over 50 hotels participating in what many like to call "Hotelpocalypse". There are an unprecedented number of hotel rooms available this year and many more have opted to differentiate between rooms with fireplaces, rooms with views, suites and by bed type. It should be noted that these distinctions will count as separate hotel selections. Submissions must have exactly 6 hotel selections. But how do you choose? In large this depends on personal preference and the importance of price, location, room size and hotel quality. I recommend looking at TripAdvisor or Expedia for each hotel that fits your location and price guidelines. Check how much a room is when the convention is not in town, guest reviews, amenities and the number of total rooms. Some hotels, like the Bristol (102 rooms) book out the entire hotel. However, as the Bristol is fairly close to the convention center (7 blocks) and reasonably priced ($188/night) you might have better luck with a larger, slightly more expensive hotel. Keep in mind that many of the large hotels may only have a percentage of rooms available through Travel Planners. Still, you may have better luck competing for a hotel like the Omni (511 rooms) or the Marriott Marquis (1,305 rooms) provided you are willing to pay a little extra or find others to share the room. If you have friends, family or co-workers you know are attending, try to make an alliance. Yes, an alliance like Survivor, because together you double, triple or quadruple your chances of getting a room. Just remember to write down their first & last names for a quick and easy cut & paste job when filling out the form. Note there is no guarantee of getting two beds and you may need to bring an air mattress to the hotel. The advantage to everyone trying for a hotel is not only do you have a better chance to get the hotel you really want, you may even get to choose between several you want. Check in with your group and strategize you lists for the best results. Don't have a group? You can try to find one on Friends of CCI or reddit.com/r/comiccon . Please remember the standard rules of the internet apply... be safe & know who you're talking to. If you're new to Comic-con or just the hotel sale the best advice I can give you is to read as much as you can. Below is a list of the pages I've found helpful. General info & the all important official hotel list. Friends of CCI - "Guide to Getting a Downtown Hotel Room"
An indispensable guide. Map of all participating downtown hotels & detailed walk-through of the hotel form. 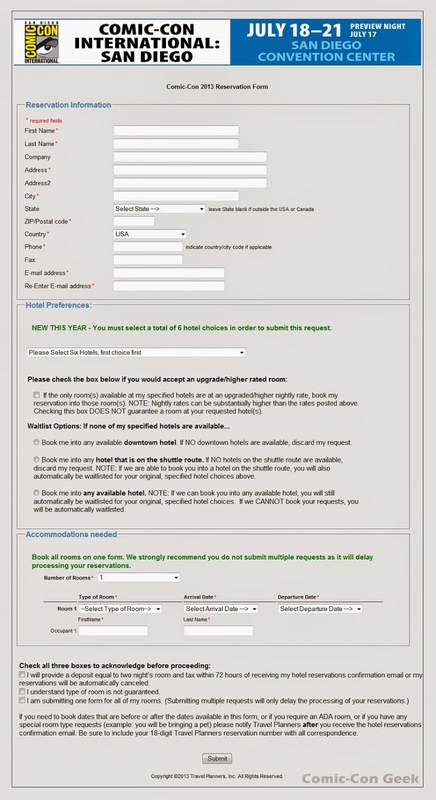 Access to a practice hotel form with forum registration. According to the site a "Hotel Exchange" is coming soon. If you still have questions after all of that, check out the FAQ. 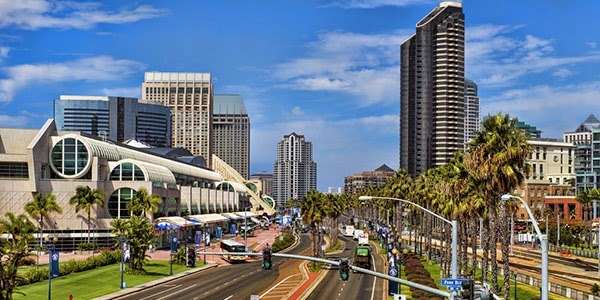 SDCC Unofficial Blog - "Guide to the San Diego Comic-Con 2015 Hotel Sale"
Overview of the general process. A great quick guide. Although this was for last year, the system is reported by travel planners to be virtually unchanged. Reddit - "A Few Helpful Thoughts When Finding Your SDCC Hotel"
A reminder of all the little things you might have overlooked in choosing the right hotel. Comic-Con Google Map of convention adjacent and nearby hotels, parking, restaurants, grocery stores, bars, trolly & bus stations. Best of luck and remember you can still opt out of all this madness if you prefer. CCI's Hotel Pre-Sale will remain live until March 24th when hotel reservations open up. Rose Marie Fox will be entering Hotelpocalypse for the 5th time this year. Comic-Con is her favorite holiday.